As the center of tourism, recreation, and entertainment on Oahu’s south shore, the town of Waikiki has attracted visitors from across the globe for decades. Waikiki is most famously known for its white sandy beaches, warm ocean water, and local surfing. Located just east of downtown Honolulu, Waikiki once served as a retreat for Hawaiian royalty, where they discovered early forms of surfing. As visitors discovered the beauty of the area, Waikiki soon developed into the international tourist attraction that it is today. From endless beach festivities to local shopping and dining, there are innumerable amenities and fun activities available to Waikiki residents. Although the town is most notable for the legendary Waikiki Beach, it is also home to six other beaches, each beautiful and attractive tourist destinations. Residents and visitors will discover an endless list of luxuries, such as shopping malls, professional services, restaurants, and local businesses. Residents may choose from surfing on Waikiki Beach, visiting numerous historic museums, or lounging in one of Waikiki’s beautiful parks. Although a popular tourist area, Waikiki caters to the needs of its residents through the close proximity of local universities, schools, and churches. Children and family residents of Waikiki have many educational and recreational opportunities available for their use and enjoyment. 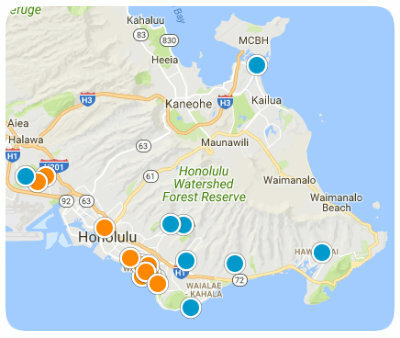 This oceanfront neighborhood contains some of the most diverse real estate options in all of Honolulu. Waikiki is known to host many townhomes and high-rise condominiums to accommodate the large population and high housing demand. Whether you choose to rent a condo, buy a timeshare, or purchase a forever home, Waikiki has options to accommodate the living preferences of all home buyers. You will find townhomes and condos with living space ranging from 500 to over 1,500 square feet, with views overlooking the tropical coastline. Buy a home in Waikiki and discover the beauty, relaxing lifestyle, and remarkable amenities of this gorgeous town. If you would like more information regarding homes for sale in Waikiki, please allow us to assist you and contact us today. The Ritz-Carlton Residences Twr 2 - 383 Kalaimoku Bldg.